I originally began this blog post by talking about yarn stash. Then I read it again and decided it’s been overdone everywhere. Besides any knitter worth her salt does not need a lesson on stashing up, or down. Let me just tell you about this new 100% superwash merino wool base in worsted weight that I found. Han from China is my main source of undyed yarn. He is amazing with customer service, and never fails to tell me if they have something new that he thinks my customers would love. So when he recommended this new base, I decided to order in a sample. The undyed yarn is smooshy and soft, looked a little splitty but had potential. It does not take dye in as quickly as you would expect from a superwash-treated base, but once you let it soak up the dye, it holds it perfectly. I decided to try and knit with it before putting it up on the shop. It works up pretty. Feels great in my hands, glides easily on the needles and did not split as I expected. The yarn bloomed after treatment and even when I tangled it during re-skeining, I did not have to curse at all because it was easy enough to unravel. 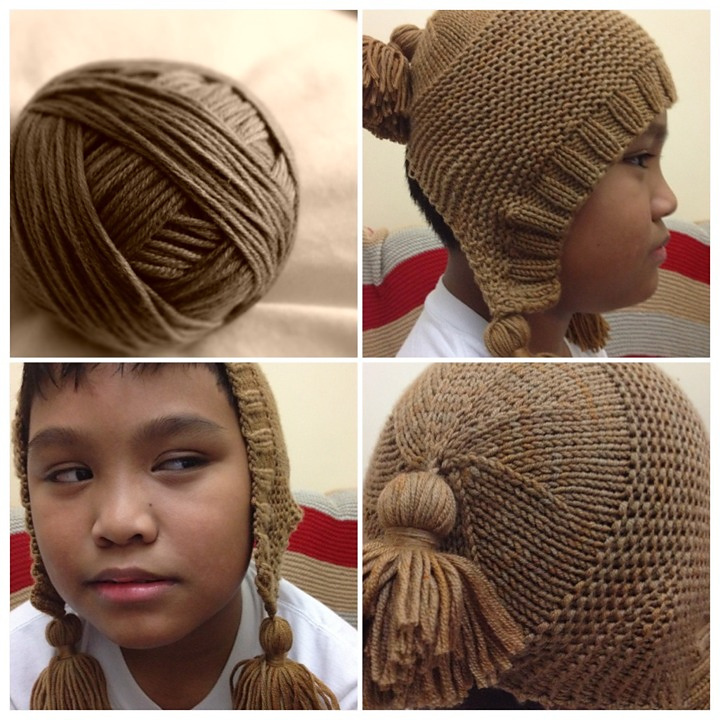 It had to be a hat, since hats are quick to knit up. The pattern I chose (Capucine) is perfect because it has ribbing, garter stitch, stockinette stitch and basic decreases. And tassels! My son loves the tassels! I love the stitch definition it gave me and I cannot wait to try out cables and lace. I was thinking about knitting up a quick shrug to see how this holds up as a garment. For now, here’s the hat I made. Slightly smaller than intended (pattern asks for bulky yarn) but it’s pretty I think. The sample skeins are in 100g put-ups, but after I came across three knots in one skein I decided to source the smaller 50g skeins. Han assures me it has no knots at all so rather than disappoint customers, I would bring the 50g skeins in and just dye a larger batch enough for sweaters and larger projects. Watch out for a name-that-yarn competition and the launch of the worsted base. More Dubai Knits lovelies, can’t wait to try some of this plushy-ness!